REPERTOIRE POUR MOTS DE PASSE 'LARGE PRINT' - SPIRALE-FERMETURE ELASTIQUE"""
Répertoire pour mots de passe écrit très gros. Couverture rigide noire. 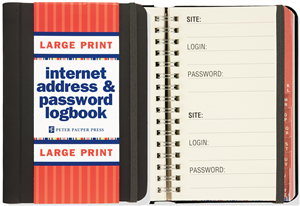 Password notebook with .rigid cover and decorated with peacock feathers.